Ocean Seafood. Chinatown, Los Angeles. One of the most disingenuous claims a freshly minted multi-million dollar lottery winner can make is that the money will not change his life. True, just before winning the jackpot this lucky schmuck was eating macaroni and cheese straight out of a pock marked pot, but that doesn't mean all those extra zeros in his bank account will have him eating foie gras and black truffles out of the same pot any time soon. Moreover, he pledges to continue to go to work — clocking in, putting in an honest day and clocking out. Socially he won't do anything extraordinary, maybe just take a vacation to Hawaii once a year but not much more. And my favorite clichéd line of b.s. is that he'll still be putting on his pants one leg at a time. I'm here to state for the record that if I ever won any significant amount of money, my life would transform into a party train — you better get on board! And as far as work is concerned, shoot, being rich is hard work! Who has time to toil when being fabulously wealthy is a full time job in and of itself? Just ask Jamie Johnson. And you can be certain that if I won the lottery, I will not be putting on my pants one leg at a time. Not a chance. Instead, I will hire a circus strong man named Thor to pick me up off the ground while two robot arms hold my trousers wide open and Thor gently places me into them. That way, I can put my pants on both legs at once instead of how common losers do it. That's how to be a real lottery winner. Here's the best part: after my pants are securely on, I'd ride my hover tram from the residential wing of my palazzo to the banquet hall. Once there I'd take my morning oolong and read the paper as a parade of dim sum carts marched around the hall, their drivers (all supermodels) calling out the delightful snacks they're shuttling, hoping that one of their wares will pique my palate. Not to mention that all of the dim sum divas' attention would be focused completely on me since I'm the sole diner. That means I'd be the only one hogging up my favorite dim sum dish — chicken feet. This is one dim sum dish I adore more than any other. I love it more than har gow (shrimp dumpling). I love it more than siu my (pork and shrimp dumpling). I even love it more than taro ball — a delicately flaky and crunchy ball of mashed taro root, pork and dried shrimp. The fact is I use chicken feet as the benchmark for good dim sum at any restaurant offering authentic dim sum. If the chicken feet aren't excellent, chances are the other dishes aren't exceptional either. Plus, after eating second-rate chicken feet, I just want to make like chicken feet and scram. But since this is MY fantasy, the chicken feet I'm relishing are flawless. However, when I'm not dreaming of sudden and extreme wealth, I like to chomp real life chicken feet at the acclaimed Ocean Seafood in Los Angeles's Chinatown. The two 900 pound gorillas of LA's Chinatown dim sum scene are the Empress Pavilion and Ocean Seafood. Both restaurants are large capacity banquet halls suitable for big parties. They can handle just about any wedding banquet maybe with the exception of a mass Moonie wedding reception. Also both are hugely popular so be prepared to wait — bring lots of friends, your 40 gig iPod or The Lord of the Rings tome! Long lines at popular dim sum restaurants forming at peak hours can make people think the Red Cross is giving away disaster relief or it's the '80s again and the last fifty Cabbage Patch Kids are on the shelves. At Ocean Seafood and Empress Pavilion, the long lines translate into "there's mindblowing dim sum inside". My friends and I typically choose Ocean Seafood because the wait time for a precious table is on average less than that of the Empress Pavilion. The most frequently asked question concerning chicken feet after "Uh, do you eat the nails?" is "Why do you eat chicken feet? There's no meat." It's true that there's not much flesh on chicken feet but that's not the reason why fans enjoy them...and, hello, McFly, the nails (talons) are clipped. Anyway, the appeal of chicken feet is more nuanced than simply tearing a hunk of muscle off bone and gnashing it. If you've ever eaten chicken feet, then you know the first sensation to greet you is the velvety smooth skin, so delicate it peels easily off of the diminutive bones. Following the tantalizing texture is the perky sweetness of the dish that will make your taste buds jump for joy. You'll unexpectedly be pleased by the succulence of the tendon and ligaments. 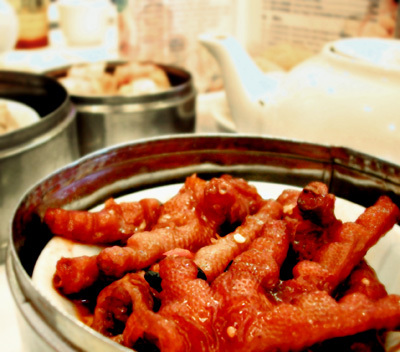 To achieve these pleasant characteristics the chicken feet are cooked in a four-part process. Basically, they cook the hell out of it. How else would you turn skin-tight, tendony, throwaway parts not even a famished, rabid hyena would eat into a small culinary miracle? Not surprisingly, chicken feet's explosion of flavor comes from a dream team of seasoning and spices — star anise, chile, garlic, ginger, sugar, soy sauce and black bean converge to form a savory magic potion. You will taste every pod of spice, dash of seasoning and drop of sauce when you wriggle your tongue in ways you never thought you could, maneuvering and coaxing every delicious, edible bit off of the bone. Chicken feet is infamously difficult to eat but once you've mastered the technique you'll be spitting out clean bones like a tommy gun blasts rounds of bullets. Eating chicken feet is like learning to tango with your tongue; only here a chicken's foot is your dance partner. Ladies, if you're one of those talented honeys hangin' out at bars tying maraschino cherry stems with only your tongue, then polishing off a tin of chicken feet will be a snap. Also, any woman who's never tasted chicken feet and tries it, automatically gets the Extreme Makeover bump in my eyes - she's instantly sexier. What can I say? Chicken feet: it's cheaper than a nip and tuck. mmmm... memories. so understated and underrated. so divine and sublime. thanks for introducing me to this and ocean seafood. we'll go again someday. but damn, the texture... feels like... BABY FINGERS!!!! lol. Thanks for the good laugh. I was in a really sad mood today, and while reading this it actually made me smile then end up laughing really hard. Thank you for making a perfect stranger laugh. Thanks everyone for the great comments! You guys keep us truckin'. Yeehaw!! I like them feet myself. Could also go for some duck tongues right now - so much better than the baby fingers. Hmmm, maybe I'll go there today! Btw, I love the idea of your blog! I'm a quite picky eater, so I never ever would be brave enough to try something like "Chicken Feet"! Respect! !